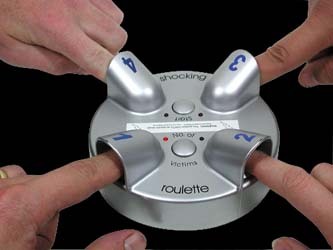 Shocking roulette is a great way of discovering which of your mates has no fear. Once you've been zapped, you are a braver man than I if you dare play again. The shock itself is not overly painful, but it does leave a tingling sensation for sometime afterwards - and I can think of more pleasurable things. Between two and four people can play at the same time. You slip your finger in one of the numbered shock stations and press the "start" button. Waiting for the victim to be chosen is about the most suspenseful thing you are likely to have to go through. The numbered lights flash as the machine beeps. This gets slower and slower, until the lights stop flashing and the beeps continue to slowly let you know it is still choosing a victim and then a loud metallic "clank" goes off as the machine electrocutes one of the victims. It's this slow process that will really test your nerve. If you can keep you finger on the electrode, then you are half way through the torture. But, assuming you don't using cheating tactics, this is the perfect way to settle any arguments and can easily be carried to the pub so that you can decide whose round it is. Great fun and cheap too.